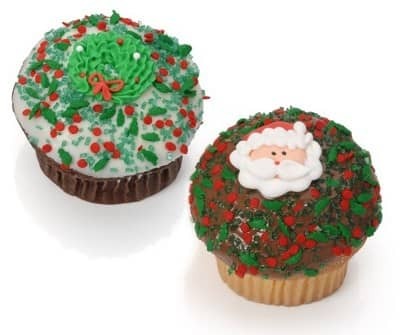 Our Christmas Belgian Chocolate Gourmet cupcakes are decadently delicious! Made from scratch, our cupcakes are moist and indulgent. Our cupcakes are decadently delicious! Made from scratch, our cupcakes are moist and indulgent. Made from the finest ingredients like sweet rich cream butter, fresh eggs, pure vanilla and Belgian Chocolates and finished with a double layer of rich chocolate topping and filled with luscious buttercream frosting in the middle for an extra moist special treat!!! Decorated by hand, our gourmet cupcakes are certain to please everyone! Hand packed in our Window Bakery Boxes and presented with a bow. It's a perfect gift!